When it comes to shopping I am REALLY good at walking away from things I should not be buying, can't afford, etc... I have been a complete mess the past few weeks over these shoes. 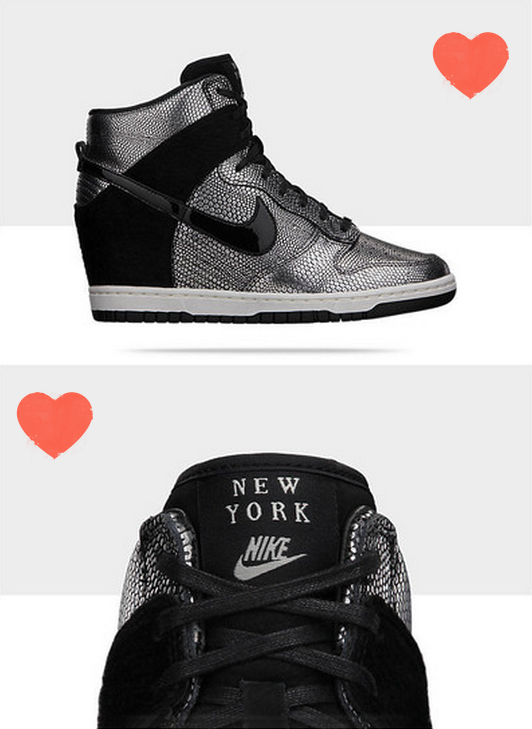 (Calling every sneaker store I know in every city, creeping online, ugh taking it to eBay and Craigslist) If I can't live in New York, damnit, I am going to get these shoes that will remind me of my favorite city everyday! Yes, because I will be wearing them everyday. Two things happened today. Pinterest and Barneys. Someone (whoever you are I owe you. big.) pinned the shoes with a link to Barneys. Then found out they got a late, small shipment in of THE SHOES. I called every Barney's I knew of. (Trust me, I know them all.) I finally got through to a lovely lady that called me sweetie by the name of Genie. (Can you believe that was her name?!) She worked her booty off and found the shoes for me in my size. I want to visit her and give her the biggest hug. Here they are. I cannot wait for Allie to take some pics of me wearing them and cant wait for them to sleep by my side every night. Omg, am I slowing turning into Cody?